Aida Ahrari is passionate about preventative healthcare. She is a graduate of the Cameron Heights Collegiate institute IB Diploma Programme (DP) and co-founded the Sun Wise Project with support from the Canadian Cancer Society to raise awareness of the prevalence of skin cancer in Peru. Aida is currently pursuing a bachelors of Biomedical Science at the University of Ottawa in Canada. What is the Sun Wise Project? There is currently a growing skin cancer crisis in Peru that is affecting many lives and creating a financial burden on the Peruvian economy. The Sun Wise Project is an international effort to address this devastating global health concern. We traveled to Peru to encourage students to begin a Sun Wise initiative at their school that will continue to educate others in skin cancer prevention and detection. Through education, advocacy and teaching leadership skills, the Sun Wise team, believes that we can address the skin cancer crisis. 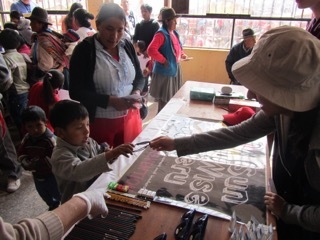 In Cusco, we collaborated with Maximo Nivel, a local aid organization. They recognize that sun safety and by extension skin cancer is in fact a major concern among locals of Cusco. As Cusco is located at such high altitudes, its citizens are at risk for skin damage due to extreme UV rays. 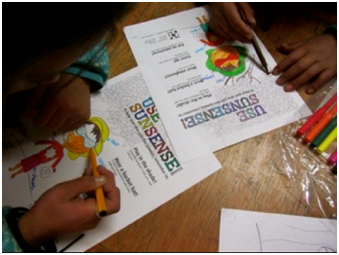 What activities did you conduct in Peru to improve education about skin cancer? 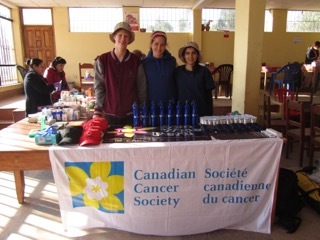 During our first five days in Cusco Peru, we educated youth at a local school on sun safety behavior and used educational games and crafts to promote the importance of wearing hats, sunglasses, long clothing and sunscreen. We also encouraged youth to avoid the outdoors between 11am – 4pm when UV rays are at their strongest. Additionally, we joined a mobile medical clinic where we incorporated sun safety education into the routine patient-physician visit. In total, we interacted with over 400 individuals and their families and donated sunglasses, sunscreens, water bottles and other sun safety supplies. In the future, we plan to continue to send over sun safety supplies to Maximo Nivel mobile clinics. This will allow the mobile clinic to continue educating the local on sun safety behavior with the long term goal of minimizing the incidents of sun burns and skin cancers. The goal of Sun Wise is to combat skin cancer in Peru. How did this specific issue first come to your attention and what inspired you to take action? Much of what drove me to take action about this issue can be accredited to my high school education. I consider myself quite fortunate to have attended a very multicultural high school (Cameron Heights Collegiate institute), where I was exposed to various cultures through my peers. In addition, the nature of my IB education encouraged me to become conscious of issues outside of my own immediate circles. It fostered in me the desire to take action towards a cause whose effect touched people beyond my own community. Having been a volunteer of the Canadian Cancer Society, I was passionate about cancer prevention. After looking at the global cancer trends, it quickly became clear to me that skin cancer was a major concern in Peru. In fact, Peru is one of the top three countries with the highest levels of UV radiation. I was shocked to learn that over four thousand cases of skin cancer are reported in Peru each year, according to the country’s ministry of health. Who did you partner with in order to bring Sun Wise to life? The Sun Wise project was founded by myself and Justin Morin, who is a fellow classmate and a dedicated volunteer of the Canadian Cancer Society. The University of Ottawa’s Faculty of Science generously supported our mission, without which Sun Wise would not have been possible. The Canadian Cancer Society too joined in supporting Sun Wise, playing a significant role in the project’s design and implementation. 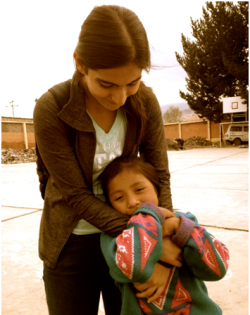 We also partnered with Maximo Nivel, a local aid organization in Cusco, Peru. Our good friend Taylor Bilodeau also joined the team in Peru. It is without a doubt that Sun Wise would not have been a success if it were not for all those who supported us along their way. What advice do you have for other students who would like to start an international volunteer project like this? I think it is important to realize that you can’t do it alone and that your most valuable tool is your partnerships. Try to use your connections and partner with organizations that you volunteer or work with. See if they would be interested in offering resources or expertise. Most importantly, try to reach out to a local organization in the city where you wish to do the project. The locals can give you tremendous insight into the pressing needs of their community. What are you currently studying at the University of Ottawa? Do you plan to pursue a career in a health-related field? I recently finished my second year of bachelors of Biomedical Science at the University of Ottawa. During my studies, I have had the opportunity to explore different avenues of health care, involving laboratory research as well as advocating for much needed health policy changes (Bill 45 making healthier choices act). I certainly hope to pursue a career in health care in the future. Something I fundamentally believe in is the importance of preventative care; because as I was once told: “the best disease to treat is the one that never happens.” I believe that the best approach to preventing disease is to build better networks between our researchers, health care providers, educators, and the general public. This is why I aspire to merge my interest in medicine, research, and preventative educational programs in my future career. You completed your IB diploma at Cameron Heights, what was your favorite aspect of the IB? My favorite part of the IB was its holistic approach to learning, which gave me a well-rounded education and a diverse set of skills. The diverse curriculum of the IB encouraged me to step outside of my areas of strength and explore avenues that helped me develop other important skills. For example, taking higher-level IB English and history, as well as the Extended Essay, allowed me to develop advanced writing and analytical skills, which have been a strong asset in university and beyond. Indeed, having the ability to clearly articulate ideas and communicate them was important when it came to writing the Sun Wise proposal and utilizing it to gain support from our partner organizations. Additionally, the rigor of the IB program taught me to embrace challenges rather than to see them as setbacks. There will inevitably be challenges when trying to get a new project, like Sun Wise, up and running from the ground up; a persistent mindset is therefore key. What are the impacts of learning in two languages?